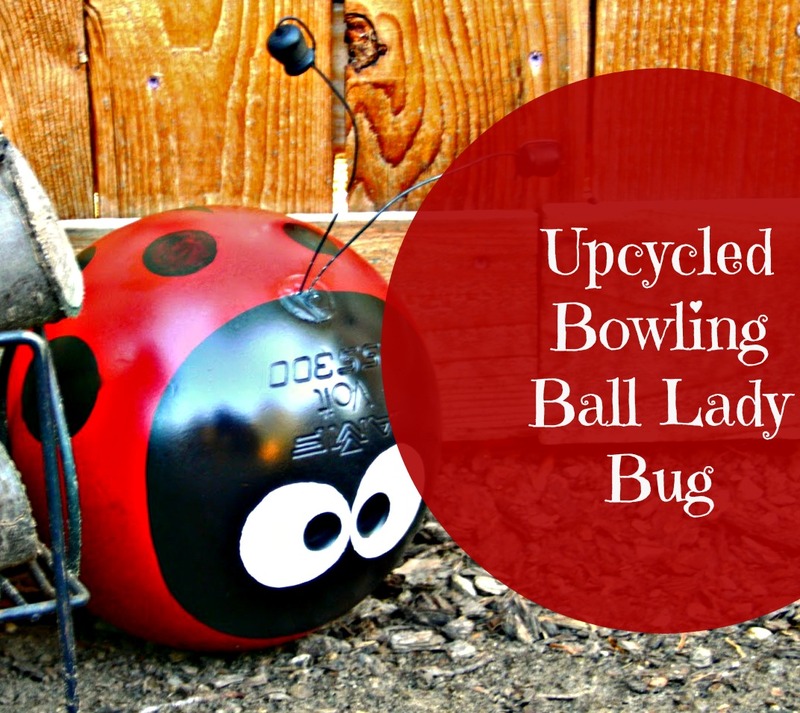 Today I'm sharing an adorable project that involves old bowling balls and paint to make a sweet little ladybug (or bumble bee) for your yard! 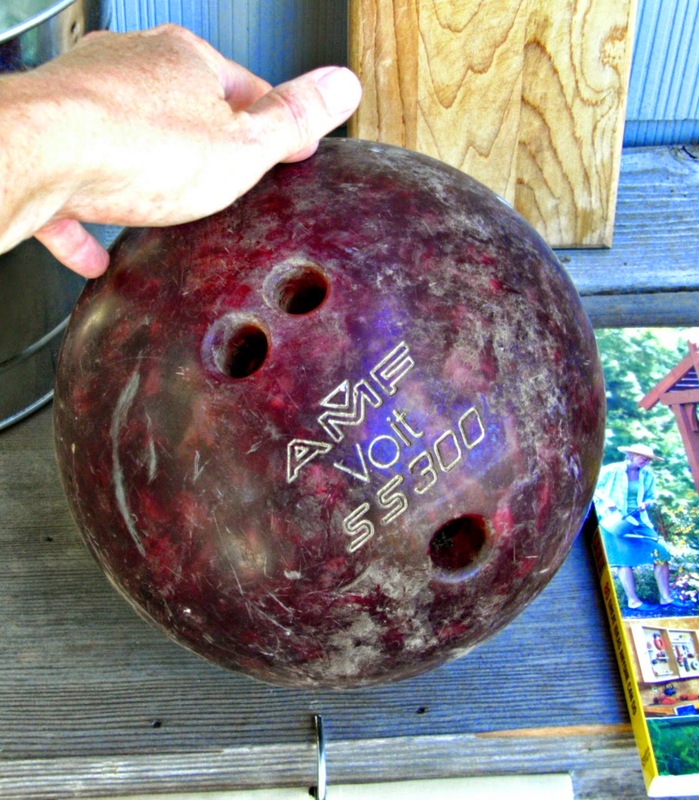 I found my bowling ball at a garage sale for .50 cents. I've seen them at thrift stores for a great price too. Step 1) Clean off any dirt and sand the ball slightly to rough up the surface. This will allow the paint to adhere to the slick surface. 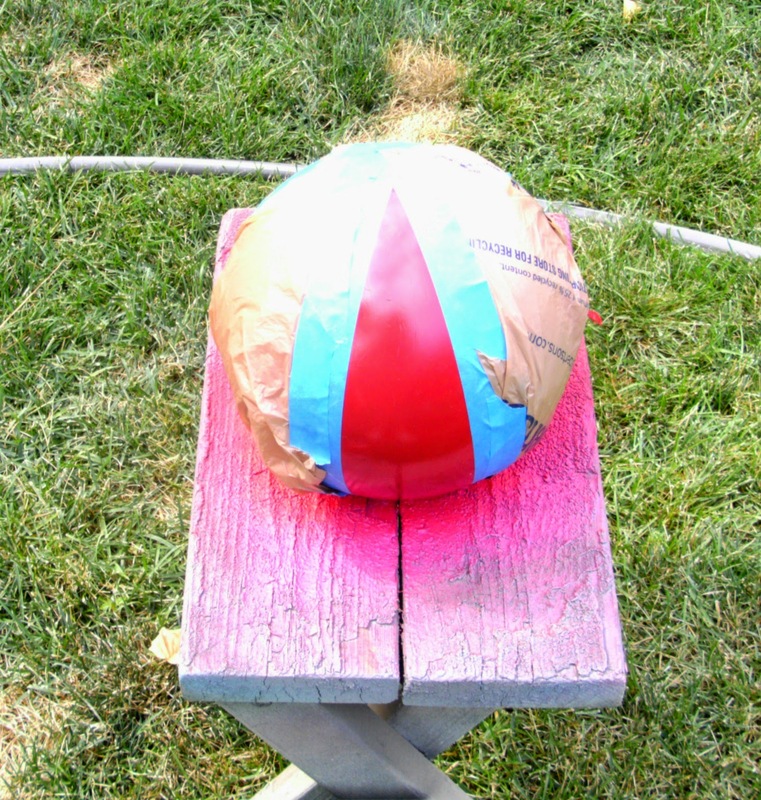 Step 2) Paint the ball with red spray paint and allow it to dry. Overnight is best. I rushed mine a little bit and had some issues with tape in the next steps pulling off the paint. ... and a pie slice shape on the opposite side for wings. I used some plastic grocery sacks to help mask off these areas. (The two finger holes will become the eyes and the thumb hole will be where the antennas will go). Step 4) Paint the areas you just taped off with black spray paint (I used flat black) and allow to dry. If you don't like the engraved writing on the ball you can fill it in with bondo or maybe wood filler would work... I am far to lazy for that much detail! 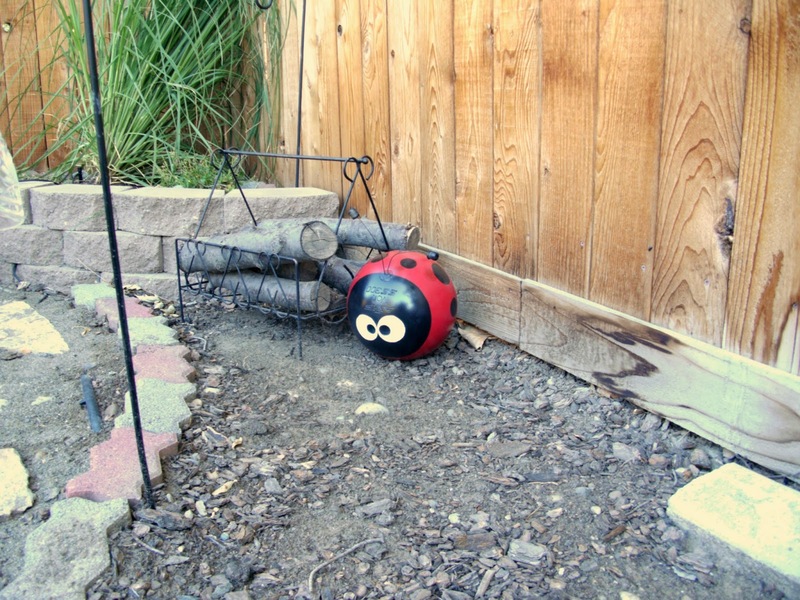 Step 5) Create the lady bug spots. 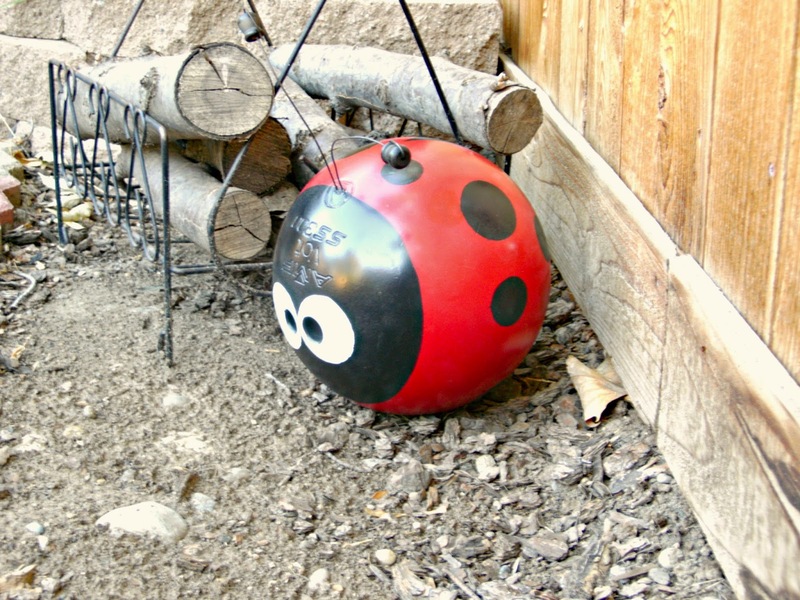 Create a mask for the lady bug's spots from contact paper. Cut two different sized holes in the contact paper (It will only take a couple of scraps). I used a scrapbooking punch for the largest hole and I traced a craft paint bottle for the smaller holes and cut them out with scissors. 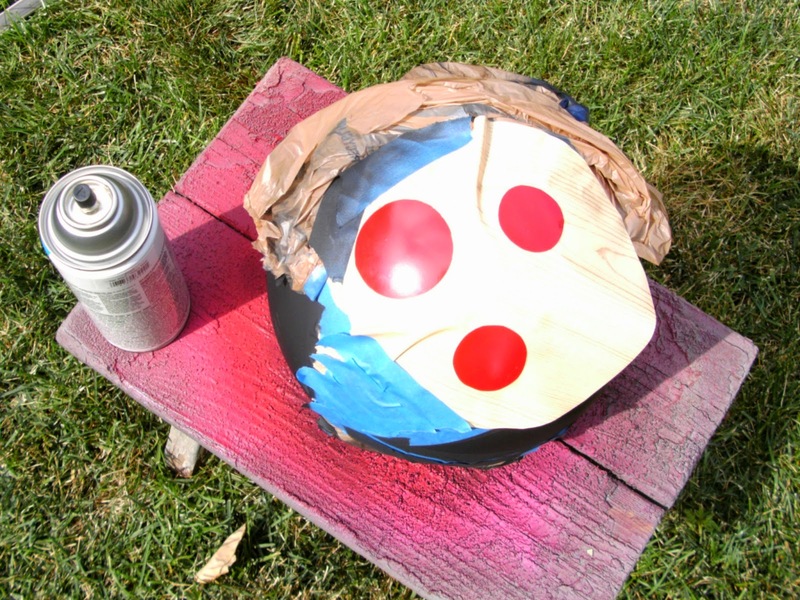 Stick the contact paper onto the ball, taping off around the surrounding areas to avoid overspray. 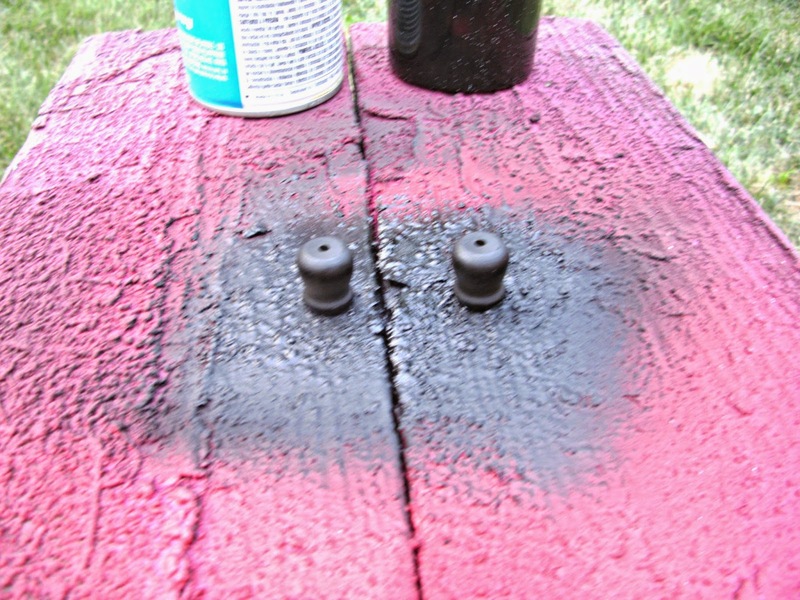 Paint the spots with black. This process may take awhile since you'll have to wait for them to dry and then reposition the contact paper to a different area of the ball. 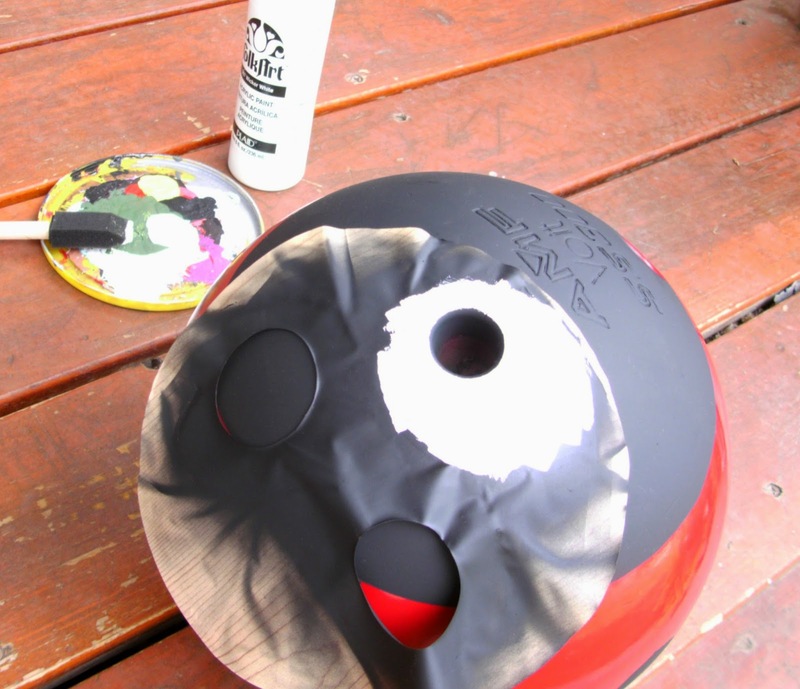 Alternatively you could freehand paint the spots with black brush-on paint. Step 6) Create the eyes around the finger holes the same way you created the spots except you'll use white paint. I used the same piece of contact paper, using the largest size hole. I used some white craft paint and a sponge brush for them. leave the insides of the finger holes unpainted. Step 7) Create the antennae. You will need Plaster of Paris and some 16 gauge wire bent in half like a 'V'. 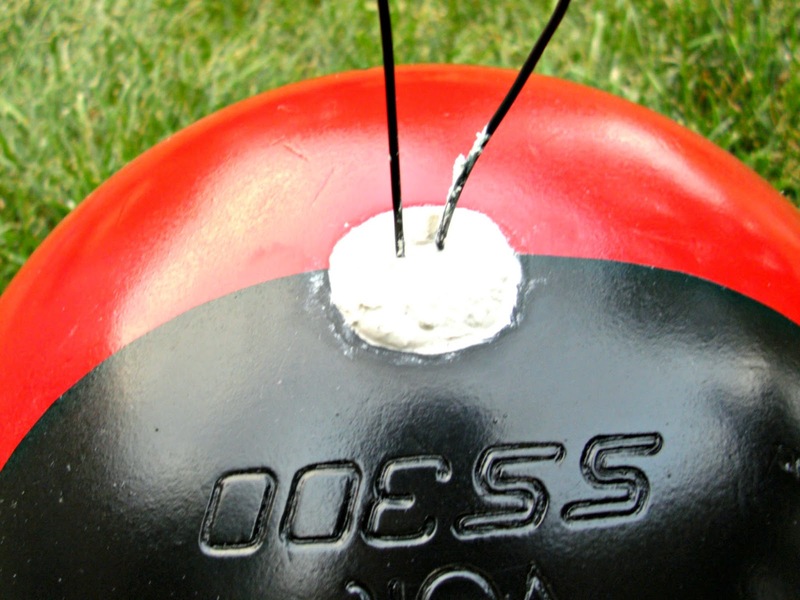 Mix up a small amount of Plaster of Paris, fill the thumb hole with the mixture, and stick the bent end of the wire antenna into it. Be quick, it sets up very quickly! I used a couple of small wooden candle cups for the antenna. You could use wood beads too. Thread the wire through the holes in the candle cups or beads and bend the wire around so they stay in place on the end of the wire. 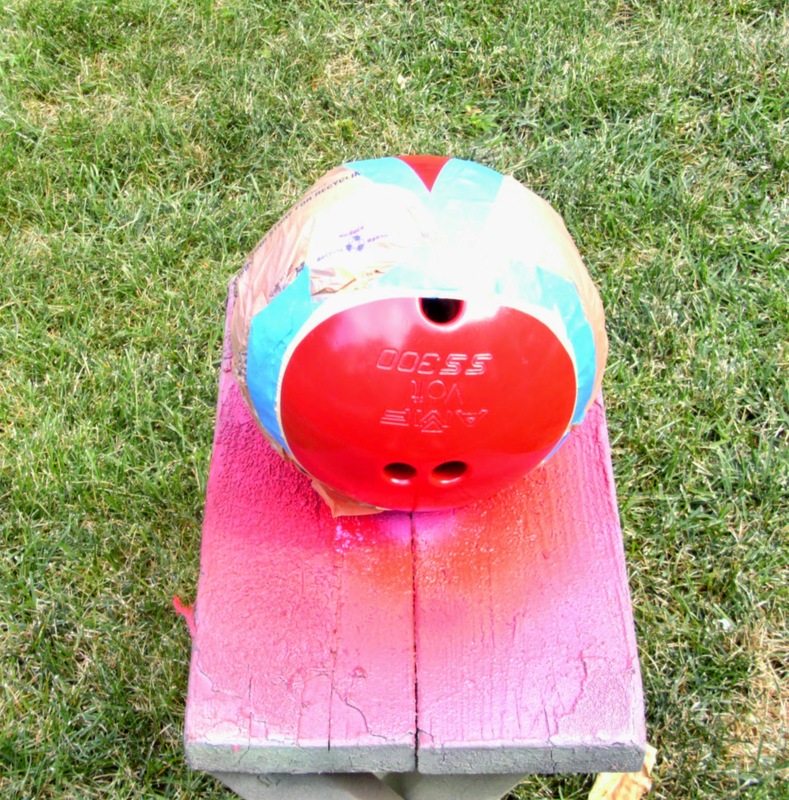 Step 8) Spray with several coats of protective sealer. That's it! 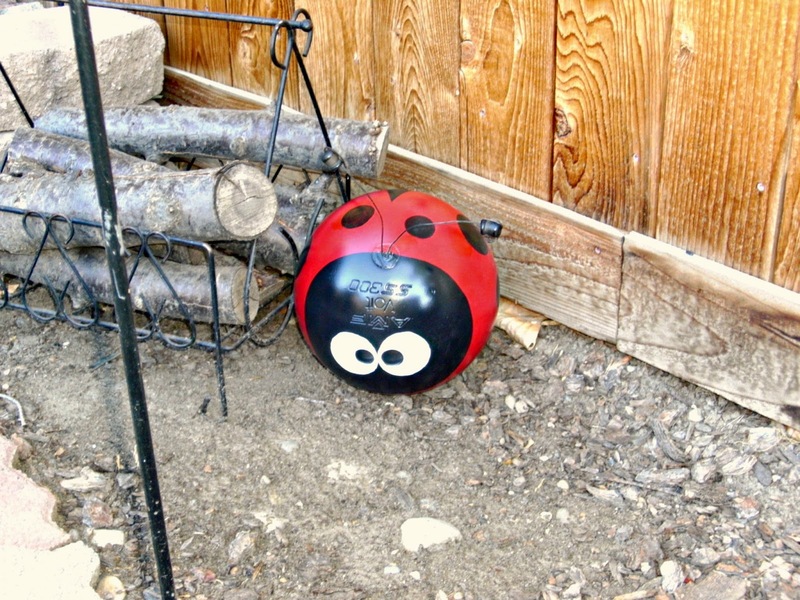 Enjoy your cute little lady bug!! 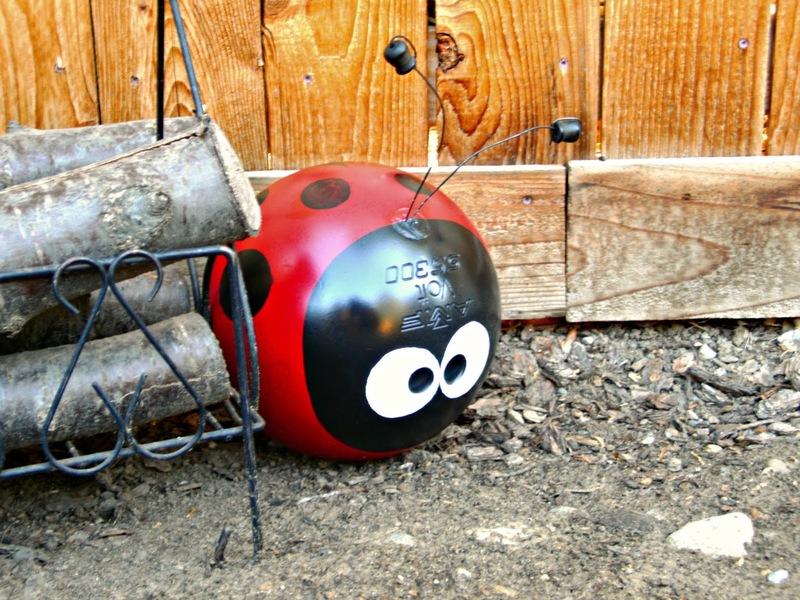 This is one yard ornament that you won't have to worry about losing during high winds! To make a bumble bee follow the same steps except substitute the red spray paint for yellow and create stripes instead of dots! 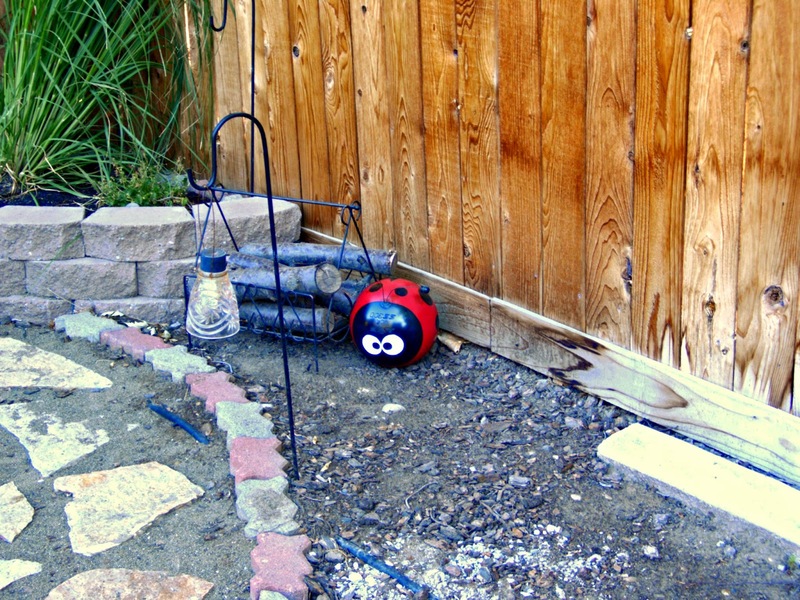 Put your new little lady in an area of your yard that doesn't get hit with sprinklers so she will last longer. You can find more upcycled bowling ball lady bugs on Pinterest here. I've seen them in different colors too! She's so cute Tania! I just love it. I have seen these before and have wanted to make one. 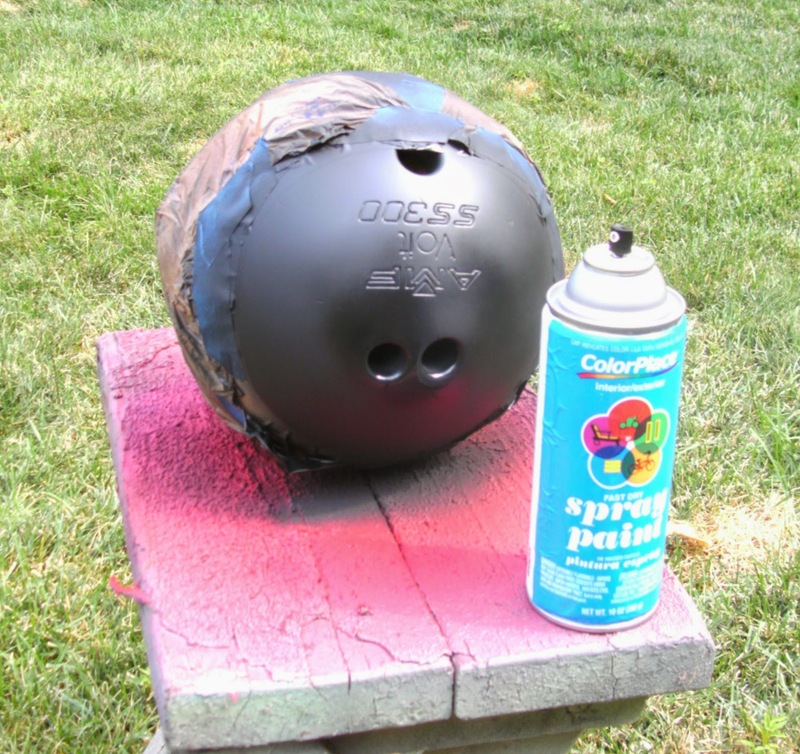 Maybe one day I will find a cheap bowling ball so I can. I'd like to make a bee too! Have a great weekend.